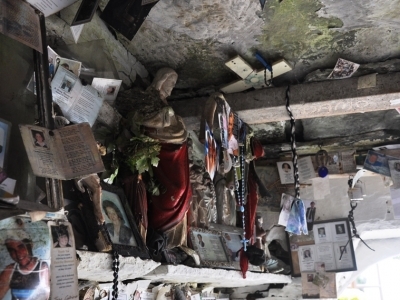 Just off the M7 (the primary road between Dublin and Limerick/Cork), lies St Brigid’s Well. 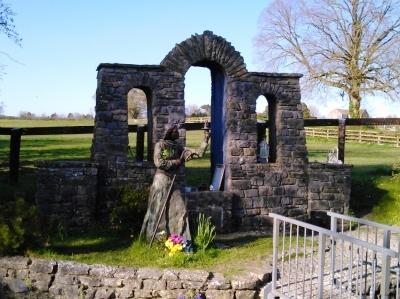 This is a very active site associated with one of the most prominent Irish saints. 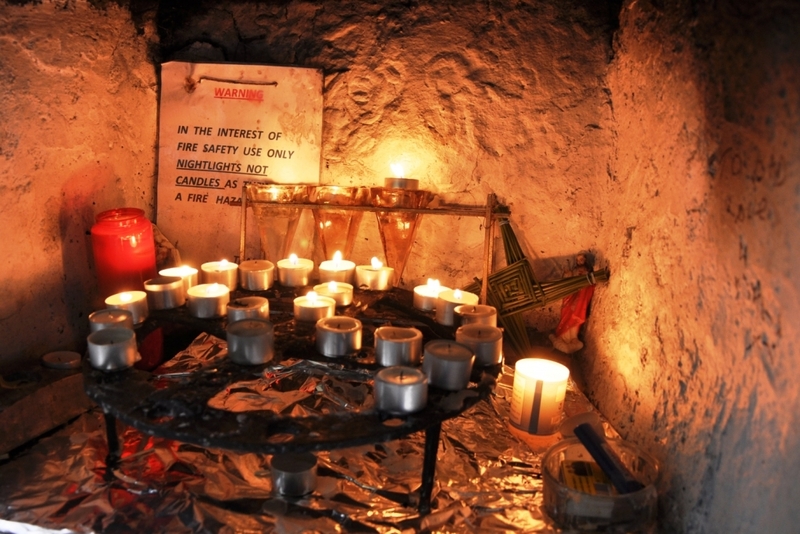 While Feb 1st is the main day to visit the well, it receives pilgrims throughout the year. The well is only a few minutes from Exit 13 on the motorway, a junction more associated with the adjacent Kildare Village Outlet Centre. This position presents a geographical juxtaposition between the modern, flowing motorway and the stationary, sedate well. Two aspects of Irish social and cultural life overlap here. The new roadway designed to seamlessly connect major urban areas, with the purpose built retail centre, boasting world-famous brands, is a newer ‘Celtic Tiger’ Ireland. While, St Brigid’s Well, a site off heritage and spiritual/religious activities, seems to be of an older, vernacular Ireland. However, there isn’t a tension, more of a co-existence. People visit either, both, and neither. Perhaps, approaching Exit 13, you might consider this and what you will do. 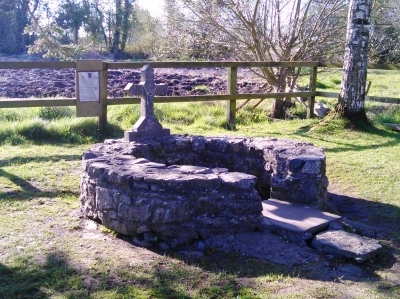 St Brigid’s Well, enclosed by a low circular stone wall. 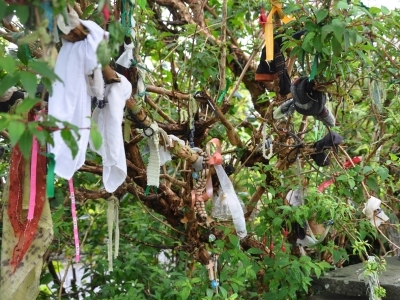 A rag tree by the well, with a selection of fabrics, tokens, and other items hanging off a branch. A statue of the saint by a modern structuring housing votive offerings. Whenever I’m in the Burren or the north-western part of Clare, I try to call by St Brigid’s Well near Liscannor. It is a wonderful site complete with a marvelous collection of votive offerings, for which it is known, in the grotto leading to the well. 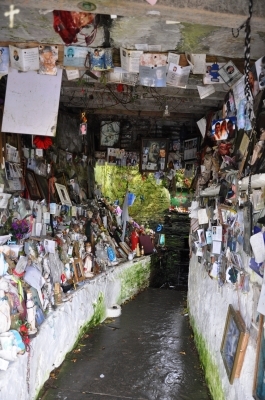 The vast collection of offerings which fill the grotto leading to the well. Votive offerings are beautiful objects each of which as an intention behind it. It has been left there for a particular reason by a person who firmly believes in the power of the place and the saint and the benefit of partaking in this custom. While some of the intentions may appear obvious, others relating to seemingly odd items are shrouded from everyone except the believer and the saint. 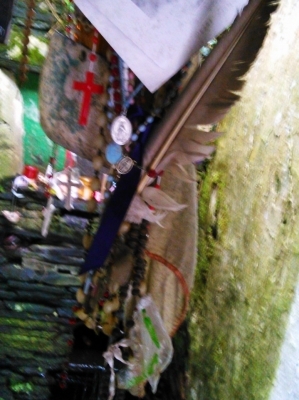 The grotto spaces is crammed full of offerings, with every conceivable space being used to leave and insert items. Initial fascination with these objects, is replaced by curiosity, concern and speculation on their intentions. This is a rich material-based cultural practice, linked both to Catholicism and folk customs, but it is also people’s lives. Dreams, despairs, anxieties, losses and a host of deeply personal motives are materialised. Accordingly, regardless of your beliefs they and the place should be treated with respect. 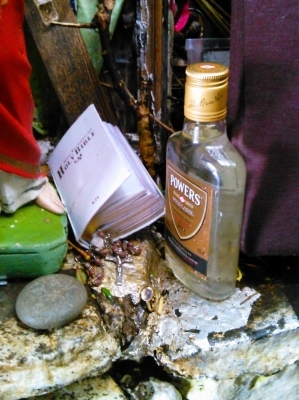 A small bible (damp from the exposed space above the well), with rosary beads inside, sits next to a whiskey bottle filled with some of the (presumably) well water. The rest between a statue of the Sacred Heart of Jesus and a cushion. A collection of offerings hanging from the ceiling, including rosary beds, miraculous medals and a feather. 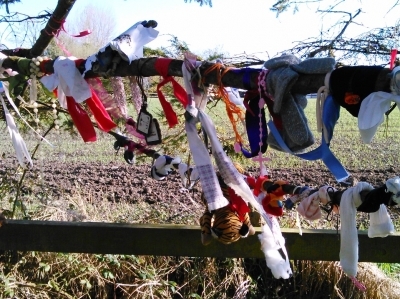 The rag tree which is over the well, with a selection of rags tied to the branches. This is a collection of short clips of pilgrims completing the rounds at different holy wells. It captures some of the movements and circumambulations that occur as part of the annual Pattern Day at these places. The completion of the practices continues established traditions in honour of a patron saint, while also ensuring that the site remains an active devotional space. Featured in the video: St Gobnait’s Well Ballyvourney, Co. Cork, 11th Feb 2013; (2.01) St Fanahan’s Well, Mitchelstown, Co. Cork, 25th Nov 2012; (2.34) ‘The City’, or Cathair Crobh Dearg, Shrone, Co. Kerry 1st May 2013; (5.29) St Brigid’s Well, Liscannor, Co Clare, 1st Feb 2013.